I hope you’re all having a good time. 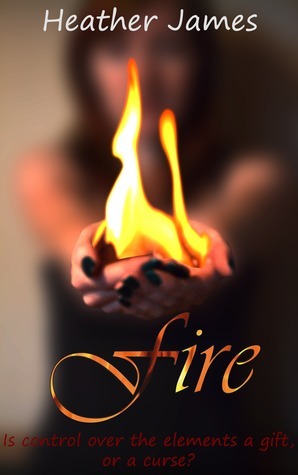 Today I’m happy to present you Fire (Elements of Power #1) by Heather James. This book sits on my TBR list now, and I hope to read it and write a review soon. Wonderful cover, wouldn’t you agree? Now it’s time for a sneak peek into Fire. Is control over the elements a gift, or a curse? Enter a world where it's normal to spark flames in your fingertips, or produce gale-force winds with a flick of your wrists. Roxy thinks that she is in control of everything: with flames flaring at her fingertips and an equally fiery attitude, what more could she need? But then she meets Brae, a prince from a rival Realm, who turns her assumptions of superiority upside down. Jasmine has none of Roxy’s confidence or intensity. But she does have a secret - and Brae - and she’s not going to give either up willingly. Fire rose high into the trees on either side of me, closing in much faster than I'd anticipated. The air was thick with heat and smoke. I had to keep moving, fast. My heart hammered against my chest, keeping time with my feet as they pounded across the uneven ground. Above me, both suns hung high in the air, shining down mercilessly and adding more heat to that of the blaze. I heard, rather than saw, the ball of flames whizzing through the air behind me, branches crackling to dust as it went. Moving on instinct, I threw myself to the ground, feeling the gritted earth graze my already filthy face and arms. Only one thought ran through my mind: they were getting closer. I pushed myself to my feet and set off again, faster than before. As I ran, I pushed a loose strand of hair - as red as the inferno surrounding me - away from my face. It had fallen out of its tie hours ago, but I hadn't stopped for long enough to fix it. The flames kept coming, attacking me from both sides so that I had to duck and weave as I went. As I darted right, my feet stumbled on the uneven terrain. I couldn't keep this up for much longer; I needed to stand and fight. "Come on then. I'm ready for you," I whispered to myself as I came to a stop. I wheeled around just in time to see a cloaked figure emerge from the trees to my left. The cloak gleamed with glittering red swirls that made it look as though it were aflame. Where there should have been a face, I saw nothing but darkness. Slowly, the figure raised his hands out towards me, toying with me; he thought I was beat. Flames sprung up at his fingertips and danced across his hands, gradually increasing in intensity. But he was being complacent. He was nowhere close to winning this fight. While he put on his pyrotechnics show, my own fingertips burst into flames, burning faster and fiercer. Before he realised what was happening, I cast my hands out in front of me, sending a ball of fire straight at his chest. Thrown back by the force of the hit, he lay on the ground, motionless. The flare receded from my fingers but the tingling sensation lingered; I was ready to attack as soon as I needed. Bending over the unconscious figure I pulled a shining silver ring from the index finger of his left hand. Shoving it into my pocket I set off again, but this time I headed left, in the direction the cloaked figure had emerged from. I'd had enough of being hunted. Heather James is a young-adult author who writes about heroines with amazing powers, heroes who will break your heart and fantasy realms that you will want to move to. She works in the attendance office of a South-East London secondary school and spends her school holidays writing, reading, playing flag-American football and using Pinterest and Goodreads. You can find out more about her over at her blog. To be in with a chance of winning one of ten e-copies of Fire, just follow Heather James' blog and enter here. You're right about the cover, especially the word fire. Sounds like we won't know who to root for, Jasmine or Roxy. Great teaser!